After several years of preparation, the Bergbau-Technik-Park (mining technology park) opened on Easter weekend 2012 near the Markkleeberger Lake in the south of Leipzig. The “stars” of the park are the 1,300-ton bucket wheel excavator 1547 and the 2400-ton spreader 1115. These two giant steel monsters are impossible to miss from nearby highway A38 (see picture above). I am fortunate to be part of this exciting project as I take care of the website and the signages of the park. The area south of Leipzig experienced in the last century one of the largest man-made landscape alterations in Europe. The reason was the increased appetite for electricity and raw materials after industrialization and a huge amount of brown coal in relatively shallow depth (80-100m) ready to be exploited. Dozens of villages were dredged and several thousand people displaced. Where once were forests, fields, rivers and towns there now emerged a landscape of lakes (Leipziger Neuseeland – Leipzig New Sealand). The “newest” lake will reached its final level in 2014 – Lake Zwenkau. The transformation of the area south of Leipzig from 1850 to 1990 (in brown: the mining areas) to 2010. The maps(Source: LMBV) are part of the exhibition in the E-House in Bergbau-Technik-Park. On the right map I added the position of the BTP. Still active is the mine Schleenhain near Neukieritzsch / Borna / Groitzsch. Another 2 new large lakes will arise here after exploitation – Lake Pereser (2051) and the Groitzscher Lake (2060). The mine became widely known for the destruction of the village of Heuersdorf – in 2007, the 665-ton Emmaus Church of Heuerdorf was moved in one piece to Borna, 12km away. The Mining Technology Park was created in the center of the former mine Espenhain. 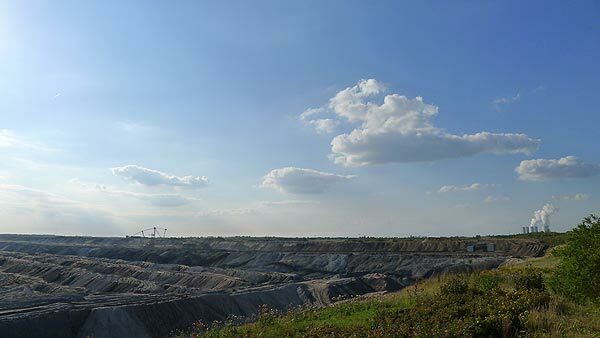 For the Espenhain mine (1937-1994) approximately 1.7 million cubic meters of soil were moved and approximately 570 million tons of lignite excavated.14 villages (the largest of which Magdeborn) were dredged and nearly 8700 residents were relocated. Originally, the mine was planned to operate until 2025, but after the renunion of Germany the circumstances changed and it was discontinued for ecological and economic reasons. The mine stopped right before the village of Dreiskau-Muckern whose destruction was thus spared. However by that time, most residents already had been relocated. In the area of the mine Espenhain the Markkleeberger and the Störmthaler Lake were created – separated from the A38 Autobahn. 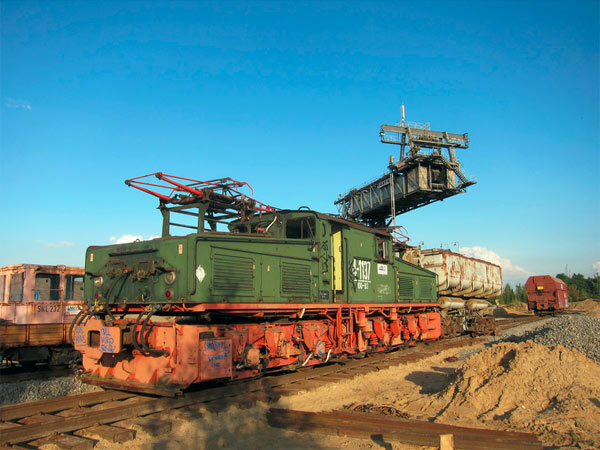 The major spreader 1115 (the big metal monster) of Bergau-Technik-Park was not only used for the transporting soil out of the mine but later also for A38 Autobahn embankment after the mine closed . Now it sits in the BTP in “early retirement”. The spreader is still in working condition however and could return to duty if its service is needed again.